DriveNow, BMW's popular car-sharing initiative, has launched a collection of electronic cars, adding a further layer to the scheme's eco-travel credentials. We're all familiar with the idea that when considered in an urban context, car ownership can be something of a mixed blessing. Growing up in London, I was indeed 'blessed' with one of the most extensive public transport systems in the world - even if at times it's a little too quaintly 'Victorian' in nature (here read - 'unreliable'). Despite this, London has one of the worst records for both traffic congestion and air pollution. It has always seemed something of a genuine tragedy to witness the daily queue of parents dropping their children off at school in huge 4x4 Range Rovers, only one adult and one child spaciously cocooned along a senseless bottleneck of empty, cavernous, CO2 spewing status symbols. So when moving to Berlin last year, I was chuffed to come across DriveNow, a car pool of Minis and BMWs that drivers can pick up and park more or less anywhere in central Berlin. For those who don't want to use a car all the time, but do want to have the option when absolutely necessary, DriveNow users can log into an iPhone app to locate the closest available car to them - usually between 100 and 500m away. The project has gone from strength to strength. DriveNow won the "best new corporate venture" award at the 2012 Corporate Entrepreneur Awards, and more importantly the 2012 ÖkoGlobe Prize - the "most important environmental awards in the mobility industry". This week, DriveNow rolled out a further innovation across the five cities it operates in - Berlin, Cologne, Münich, Düsseldorf and San Francisco. 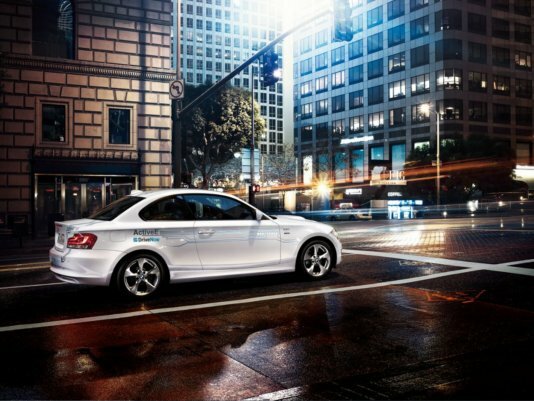 Electronic cars from the BMW ActivatE range. The cars can travel up to 90km before needing to be recharged - perfect for a short city hop - and can be topped up at various ports located across the respective cities. Not only has DriveNow contributed to a small yet not insignificant revolution in how city dwellers think over their transport needs, but they've gone one step further and produced a series of zero emission cars that - in the short term - contribute towards better air quality in our busiest cities.